As I was working on the Ivy stack I was also building out a brand-new RapidWeaver theme. Before I could get it wrapped up the holidays quickly overtook me and this new design got set aside for a little while. I picked it back up at the beginning of the year after returning to work and I think it was a good thing it got delayed. Once I dove back in to building out this new theme’s variations and options I felt inspired again and it received many new features that I’d not had on my checklist before the holiday break. This all led to a beautiful, responsive new theme called Hive. So let’s dive into some of what the Hive theme offers and have a look also at the product page and live preview site. These aren’t Hive’s only features though. There is a lot more to see and learn about this beautiful new theme. Be sure to check out the Hive product page to read up on all of its features, as well as to check out our overview and tutorial videos, along with our live preview site. If you need some great stock images to use in Hive’s banner area, site background or ExtraContent area background, be sure to check out our stock images section of the site. We’ve got a lot of great abstract stock art that works wonderfully for these purposes, and are always adding more. Build beautiful, clickable buttons that allow you to link to internal pages, other sites, and much more using our Flat Button stack. You can easily configure their look and feel with a variety of options. Looking to create stunning slideshows for your site? Checkout the Orbit stack. 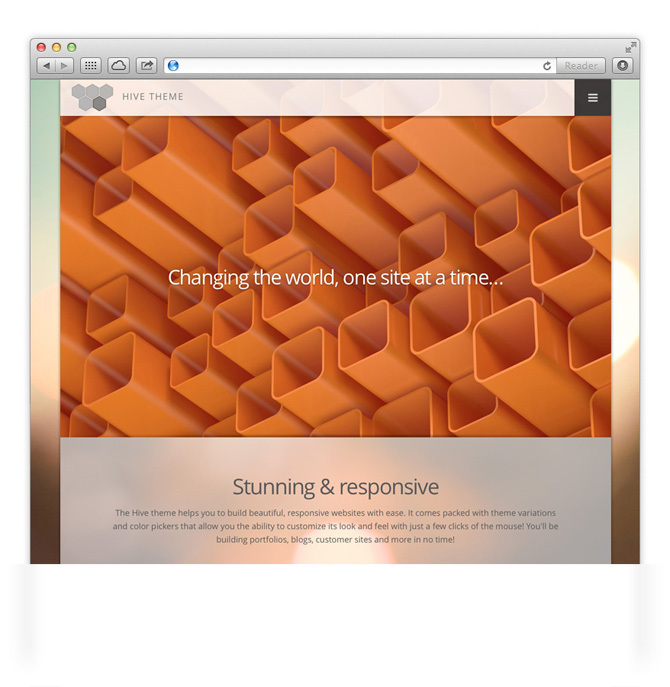 Its responsive framework is great for themes like Hive. You can make sliders of images or full on content.